It’s hard to believe that one of the most popular illegal drugs in existence was relatively unknown just a few decades ago. 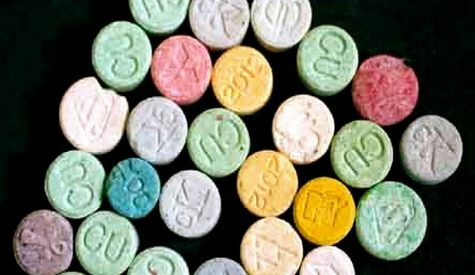 MDMA no longer enjoys the relative anonymity it had in the 80’s and 90’s, as an estimated 25 million different people use the drug per year. It is present in almost every country in the world, and certainly in every city and state in America. Although the majority of users are teenagers and young adults, there is no particular socioeconomic group that uses more than the other, and it’s popular in urban, suburban, and even rural areas. MDMA is an abbreviation for the actual chemical compound that is tough to spell and even tougher to pronounce. Its scientific name is 3,4-methylenedioxy-N-methylamphetamine but on the street it is usually referred to as ecstasy, molly, E, or X. There are a host of other less common street names such as rolls, clarity, and beans. The street names are often used interchangeably, when in fact they mean different things. Ecstasy is the pill form of the drug, which comes in hundreds of different colors and designs. The pills are typically mixed or cut with other active and inactive chemicals, and most of the time it is simply impossible to tell what is actually in the pill by its appearance. Molly is the powder or crystalline form of the drug, but once again it is often cut with other substances similar to the process of preparing cocaine. In the past few years law federal and state law enforcement officers have focused more of their efforts on busting designer drug rings. This is most likely in response to the increase in poison control calls due to designer drug overdoses and ingesting deadly fake ecstasy pills. The DEA actually just announced a huge international MDMA trafficking bust with ties to China and 20 different states including Maryland. And law enforcement on the local level has become more aware of street level MDMA distribution operations and places where the drugs are being purchased and used. Cops all over Maryland have made cracking down on ecstasy use a top priority and as a result we are seeing more of these cases ending up in the district and circuit courts. And when the cases end up in court, prosecutors and judges are coming down hard on defendants. This is why it is absolutely necessary to have a skilled and experienced lawyer if you or a loved one is facing a criminal charge involving a controlled substance. Defending a molly case is much different than defending a run of the mill marijuana or other CDS case. The chemical compounds that are found in designer drugs vary greatly, and often these cases are improperly charged by the cops and the prosecutors. Keep in mind that if you are arrested for possession the state must prove that the substance at issue was tested and found to be MDMA. If not, there may be motions to dismiss that can be filed on your behalf. Under Maryland law this substance is treated as a hallucinogen and not a narcotic. The maximum punishment for simple possession is 1 year in jail, and the maximum for sale or possession with intent to distribute is 5 years for a first time offender. If you would like to set up a free consultation about your case feel free to contact us anytime at 410-207-2598. The Herbst Firm has extensive experience handling designer drug cases, and we know how to get results.